Why are there moments that one can easily find the same artist at many galleries at the same time? It happens at every fair, many dealers exhibit the same artist from the secondary market. At TEFAF this year there seemed to be many more Emil Nolde (1867-1956) watercolors than one would normally expect to find at a single venue and they were mostly watercolors of flowers. A less well known artist, who seems to have come more to the fore recently, is François de Troy (1645-1730). During his life time he was extremely well thought of but, in the 20th century his son Jean-François de Troy became more popular. There was also much confusion. When I first went to the Louvre photo archive to research De Troy they had these two artists mixed up in their boxes. Now, many years later, it has all been straightened out. Since I was interested in this artist for many years, I found several of our paintings in these boxes as well. Now at TEFAF the Didier Aaron gallery had two François de Troys. One they sold on opening night to an American museum and the second, which was a lovely small picture representing the signing of a contract, was still available when I left Maastricht. This, of course, made me think about two wonderful de Troys in my own inventory. One is a portrait of a Louis Claude Le Blanc (1669-1728), French Minister of War. The other is a family portrait relating to a picture that de Troy did of his own family. In this case, however, the artist has done a commissioned work and we do not know who the sitters are. The two sculptures on each side of the fireplace representing charity and justice point to the fact that the picture represents a Magistrate and his family. In the background, one can see two young servants bringing a table out to the family with afternoon tea. In reality it was probably not tea, but a much greater delicacy, hot chocolate, which attested to the fact that the family was well-to-do. 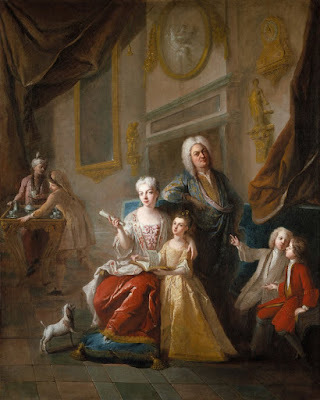 It was not unusual to show a sitter at his and her very best displaying all of their finery in order to demonstrate their position and success in life. This was, of course, one of the main reasons to spend the money to have one’s portrait done. For more intrigue from the details do take a look at the paintings section of our website, www.stiebel.com.